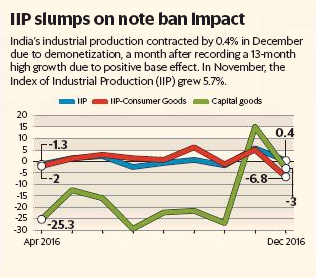 Industrial production contracted in December due to a sharp decline in production of consumer goods, confirming a demonetisation-led contraction in demand. The Index of Industrial Production was 0.4% lower in December from a year ago, well below 5.7% growth in November and consensus expectation of around 1% in December. The cumulative IIP growth for April-December is 0.3% against 3.2% for the same period last year. The Purchasing Managers' Index had suggested subdued manufacturing sentiment both in December and January. The decline is largely due to consumer goods-driven 2% contraction in manufacturing, the largest component of the index. Electricity generation was up by 6.3%, while mining output rose 5.2%. Lack of cash seems to have dented demand for consumer goods, which spilled over to 6.8% decline in production. Within consumer goods, production of durable goods fell 10.3% from a year ago in December, while that of non-durables or the FMCG goods was down 5%. Capital goods were lower by 3% in December, confirming subdued investment sentiment. As many as 17 out of 22 manufacturing sub-sectors re ported contraction in the month of December with office, accounting and computing machinery leading with a 23.9% contraction. The data provide evidence of a softer second half following demonetisation. The Economic Survey expects FY17 growth to be in the range of 6.5% to 6.75% compared with 7.9% in FY16. The RBI expects GVA growth in the current fiscal at 6.9% compared with 7% estimated by the Central Statistics Office without factoring in the impact of demonetisation. The central bank has said demonetisation will have a `transient' impact on the economy. The RBI on Wednesday decided not to cut rates citing upside risk to inflation, disappointing markets that had penciled in a 0.25 percentage points cut. Banks have lowered interest rates, thanks to the surge in low-cost funds due to demonetisation, and the impact of lower lending rates could be seen on demand within a few months though January is likely to be lacklustre.